A single trip and a life is changed forever. The life? Wisconsin state Rep. Jimmy Anderson. A drunk driver killed his entire family, leaving him paralyzed from the waist down. In his office in Madison, Anderson spoke of that fateful day. "I see my little brother, he has blood all over him," Anderson said. Anderson is 32 years old. When he was only 26, a drunk driver T-boned the vehicle carrying his entire family. Gone — his father and younger brother. Anderson was the lone survivor. "I remember hearing a smack, and the next thing I'm in the SUV hanging upside down," Anderson said. The crash left him a quadriplegic. "I feel like a burning sensation throughout my body. I feel myself kind of hanging, and I want to move, and I can't," he said. Today, Anderson works to change the drinking culture in Wisconsin. "I think the first thing we ought to do is make a first-offense OWI an actual criminal penalty," he said. Wisconsin is the only state where a first-time OWI offense is not a criminal offense. Anderson's nonprofit foundation, "Breathe Clearly," supports victims of OWI crashes. Anderson admits, "We don't do enough to help people get beyond whatever it is that's forcing them to the alcohol." The rewarding work of his foundation motivated Anderson to run for the state Assembly. "Being able to help others has given me so much joy. I thought, 'How can I keep doing this? How can I keep expanding this opportunity?' That's why I ran for office." Anderson refuses to look in the rearview mirror with bitterness. 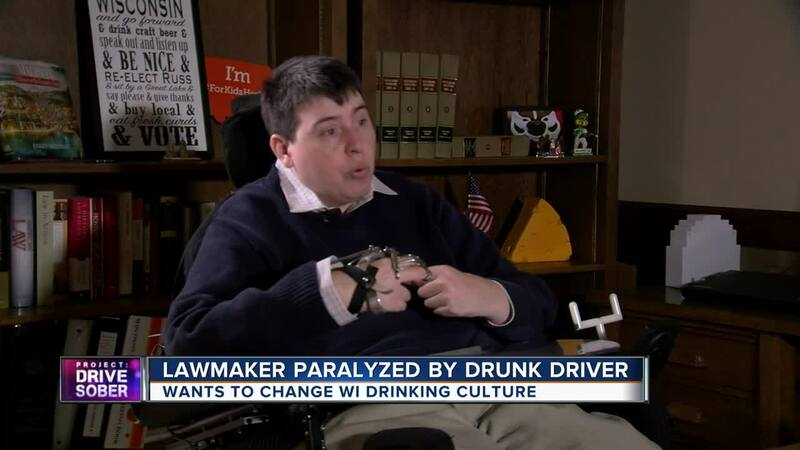 His empathy for the inebriated driver who left him paralyzed is stunning. The man who caused the crash that killed his family died. But what would Anderson say to that man if he could? "I would just want to show him compassion. Maybe if there had been more kindness and compassion in his life, maybe he would not have been compelled to drink to excess or to use drugs," he said. Parked in Anderson's mind are lessons learned from his parents. "They worked so hard to try and provide me with a better life. To see how hard they worked and persevered, through all of the difficulties of life, it taught me to appreciate what I have and never be afraid of hard work," he said. Anderson gets emotional remembering his parents and what he would say if he could see them again. "I'd tell them I miss them. I just hope you're proud. They worked so hard to provide me with a good life, I don't want to waste that," he said. And from a highway of hell, Anderson travels hopeful streets paved with light and love. "I've got a lot of people around that give me a lot of love and support. That's what keeps me going every day."